of projects which promote sustainable economic growth. MKA Economics has conducted the socio-economic, tourism and recreational impact of numerous renewable energy proposals across the UK, including the Coire Glas Pumped Storage Scheme for SSE in 2018. 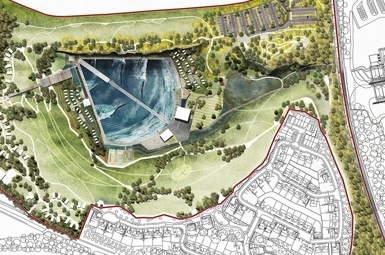 MKA Economics led the economic impact assessment of Scotland's first Wavegarden (see image below). In 2018 we completed the economic impact assessment of DCA in Dundee and SWG3 in Glasgow. MKA Economics completed the impact assessment of the Ladies and Men's Scottish Opens held at Gullane in July 2018. Other event impacts in 2018 include Oban Live, Eilean Dorcha Festival, Hebcelt, Fringe by the Sea and The Saltire Festival.